I couldn’t think of a better place to be on a freezing cold January evening than Newcastle City Hall watching an artists who has become a contemporary musical icon. 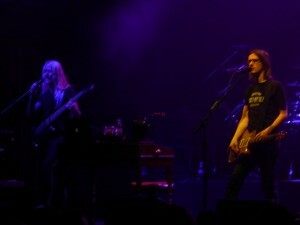 Steven Wilson certainly does fit the bill and the welcome he got from his audience was testament to it. After a period of watching the fascia of an apartment block projected on the giant on stage screen for what seemed like an eternity boards man Adam Holzman strolled to is station and started to play the intro to First Regret from Steven’s Hand Cannot Erase album. Indeed the album was played in it’s entirety forming the first of two sets. As the other members of the band followed sway a few seconds later it became evident that some changes had been made to personnel. Replacing Marco Minnemann on drums was session man Craig Blundell, a seasoned player who fit just like a clove into the Wilson juggernaut. Replacing guitar magician Guthrie Govan was one of the best hired guns in the business Dave Kilminster. 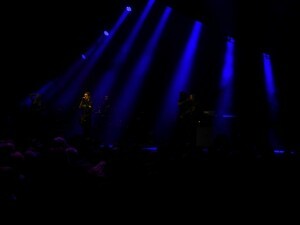 Missing were Theo Travis (sax and woodwind) and Ninet Tayeb ( vocals and backing vocals). Stand out songs from this set in my opinion were Routine accompanied by the beautifully animated film directed by Jess cope which i found rather disturbing and Regret #9 featuring one of the best Moog solo’s i have heard live for many years. Adam Holzman really is a joy to listen to and coupled with Dave Kilminster’s killer delivery really did have the tingle factor. Steven Wilson himself is no slouch, his guitar playing and singing on form all evening. The Hand Cannot Erase set was intense, dark and powerful filling the mind with sound and image that was still fresh in the mind on the way home in the car. Mind blowing in fact. Nick Beggs bass and Chapman Stick playing was as ever outstanding and he was good enough to make himself available in the foyer afterwards to sign copy of his latest project The Mute Gods albums. Following a very quick brake the band returned to perform their second set predominantly made up of Porcupine Tree songs the first being Dark Matter quickly followed by Open Car and My Book Of Regrets. Songs of which i was unfamiliar with. I found them a little bleak and hard edged for my liking though the crowd most certainly didn’t. 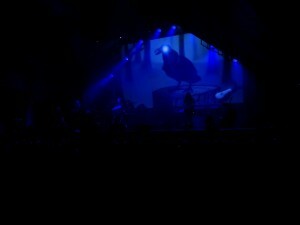 During this set the gauze screen was unfurled to very striking effect and by now one of Steven Wilson’s trademarks. The standard of playing throughout the whole evening was of master class and i for one simply revelled in it. A personal tribute to the late David Bowie was well received and the Porcupine Tree song Lazarus was played in his memory. However, the song i enjoyed the most of this set was Index. Played with some gusto i was blown away. The set ended with another Porcupine Tree standard Sleep Together. Though left baying for more at the end of such a lengthy performance the band returned quickly to the stage for their encores. Something i found refreshing rather than the falsity of standing in the wings whilst people sweat on missing their train or suffer from sore hands. The final Porcupine Tree song of the evening The Sound Of Musak rang out to the crowds delight and it certainly had feet tapping and air guitars played. The last song of the evening and without doubt a perfect choice was The Raven That Refused To Sing. An out and out winner with me It was a fabulous conclusion to an equally fabulous evenings entertainment. If you haven’t yet seen Steven Wilson in his current guise i would thoroughly recommend you try and catch one of the remaining shows as i have a feeling he is about to change his own well tried and tested though dated formats. Certainly the prolific inclusion of Porcupine Tree songs in his present shows leads one to think that some kind of reformation may be in the air? I did feel a little cheated with regards to two important members of the band weren’t present as they were at other shows in the tour and that some of the Hand Cannot Erase songs were left just a little wanting in the absence of Theo Travis and Ninet Tayeb. That said, it’s great to witness such performances at the City Hall as they are few and far between at the moment. I can’t help thinking that Steven Wilson has set a difficult presidence and makes you wonder which direction he will take next? I wouldn’t want to see him as a Brian Pern type figure of which he is in danger of becoming. What an evening!